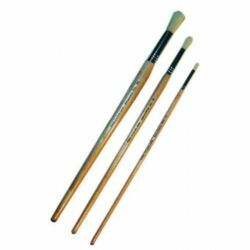 Catalog Home > Arts & Crafts > Brushes > Art Class Most popular brush! Art Class Most popular brush! Group: Art Class Most popular brush! Series 582 Round: Round Chinese Bleached Hog Bristle poster brushes long varnished handles, seamless aluminum ferrules. Série SÉRIE 582 ROND: Pinceau rond, soies de porc purs, manche vernie, frette en aluminium poli, sans couture.